Starting this summer, Chevrolet will have some of the fastest vehicles on the roads, and that has nothing to do with horsepower. 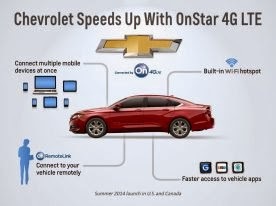 Chevrolet drivers will be enjoying high-speed data – made possible by a new OnStar 4G LTE connection in the vehicle, running on AT&T’s network, the nation’s fastest and most reliable 4G LTE network. Chevrolet today announced at the Consumer Electronics Show that the 2015 Chevrolet Corvette, Impala, Malibu, and Volt would be the first General Motors’ vehicles to come optionally equipped with OnStar 4G LTE. They will be followed by the Equinox, Silverado, Silverado HD, Spark and Spark EV. In the Canadian market, OnStar with 4G LTE will be introduced on the Chevrolet Trax as well. The majority of the 2015 Chevrolet lineup in the U.S and Canada will have a 4G LTE connection built-in at vehicle launch. More models will be announced later this year. The 4G LTE rollout will bring a built-in Wi-Fi hotspot to most Chevrolet vehicles, which allows passengers to connect their personal devices, such as smartphones, laptops and tablets, to high-speed wireless internet. Each vehicle can accommodate multiple devices at one time. With OnStar’s 4G LTE connection, the vehicle acts as a mobile hub, giving customers easier access to apps and services that require a high-speed cellular or data connection. The vehicle will employ a wireless connection that does not rely on a brought-in mobile device. In collaboration with AT&T, the data connection in the car will be fast – and flexible. Current AT&T customers will be able to add their vehicle to a shareable bucket of data through AT&T Mobile Share plans. All drivers can also pay for data as a standalone option. Additional pricing and data packages for OnStar 4G LTE will be announced later in 2014. Chevrolet MyLink will offer consumers an enhancement with the built in AppShop, available on select 2015 Chevrolet models in the U.S. and Canada. AppShop will benefit from the embedded 4G LTE connection. Chevrolet AppShop is accessible through an icon on the MyLink screen that allows owners to view all available apps and download them directly to the vehicle, then organize, update or delete them as needed. Available apps will connect drivers to vehicle data, music, news, weather, travel information and more. An initial list of planned apps announced today includes Vehicle Health, iHeartRadio, Priceline.com, The Weather Channel, NPR, Slacker Radio, TuneIn Radio, Cityseeker, Eventseeker, Glympse and Kaliki. Chevrolet’s 4G LTE launch coincides with the 10th hardware generation of OnStar, a service that debuted in GM vehicles in 1996. The upgrade will allow for voice and high speed data services. 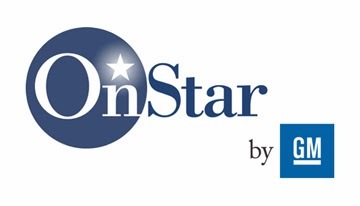 OnStar Advisors currently respond to approximately 185,000 calls every day or more than two calls every second. OnStar is standard across the 2014 Chevrolet lineup. The OnStar RemoteLink Key Fob Services smartphone app, which allows owners to lock or unlock doors, activate the horn and lights, and remotely start a properly-equipped vehicle, is included for five years for properly equipped Chevrolet vehicles in the U.S. Your site is actually incredible. Can I follow you on Facebook?